For at least half of "ABQ," I wasn't typing notes. I was staring at the screen with my hands over my mouth. Anxiety and shock bring on that response, and tonight's season finale had both, in deep, sorrowful abundance. For some of you it might have been too much — too many climaxes, too much sudden change. For me, it was horrific perfection. I can't imagine a more fitting commentary on the theme of Walter's control obsession than the unraveling of his marriage on the ground, coupled with the disaster in the skies over his house. His murder of Jane (yes, I'm still calling it that — whatever its legal status, morally it was the killing of another human being) leads to the death of who knows how many people, because her father has lost the ability to perform his job — to control the skies. Bodies are going to rain from heaven. It might not be anyone we know in those body bags (oh Lord, I hope it's not anyone we know), but the consquences of Walter's descent into a twisted morality designed to save only his own sense of himself are widening and growing ever more agonizing. As Jesse breaks down following his discovery of Jane cold and dead beside him — as Walter runs out of words to convince Skylar to rethink their relationship — our response as the audience is practically straight out of Aristotle's poetics. Pity and fear. We pity Jesse, whose too-soft-for-the-streets heart, addictive personality, and hunger for love has left him with nothing at the very moment when he thought he was the richest. We fear that Walter's dilemma could be any of ours: measuring values against people, measuring people against ourselves, finding all the lines that used to govern us fading away. We see ourselves most thoroughly, perhaps, in Jane's father. He arrives to help his daughter make a new start and finds her being zipped up in a body bag and hauled out on a gurney. In shock, he can barely answer the perfunctory questions put to him: "Mother's maiden name and place of birth?" says the functionary filling out her form. "My mother?" he responds in bewilderment. Entering Jane's apartment, he barely looks at the mural she's painted on her bedroom wall: a woman twirling in an eddy of space (and a pink teddy bear floating nearby). He complains on the phone that all she has in her closet are black clothes, and tries to convince himself that a navy blue dress will look good in her coffin. And seven weeks later, as Walter is making his triumphant re-entry into life with a new goatee, a scar where his cancer used to be, and a son talking about how wonderful he is to the newspapers and the TV cameras, Q is returning to work because he can't think of anything else to do. Then, simply by doing nothing, he kills. From the perspective of those around them, one man seems to be on the way up, while the other is trying to come in for a landing. But they've already collided, and they don't even know it. Behind the notes on the oncologist's chart and the scribbles on the coroner's form, behind the official records, there's a massive unknown story. Yet its outline is already present on Hank's bulletin board of the Heisenberg operation. All it will take is one more picture moved from the donation jar to the wall in the right place — one more arrow connecting the dots. "I deserve this," Walter said in the desert when he thought he was going to die right then and there. Jesse repeats it to him in his grief. 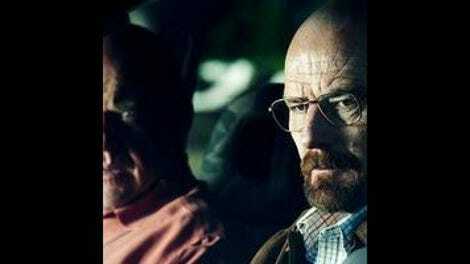 "I killed her," he gasps, and Walter takes pains to correct him. Isn't that what he thinks he's been doing all along — sacrificing for the good of someone else? Crucifying his moral rectitude, his health, his relationships, so that in the years to come everyone else will prosper? Now he's taken the ultimate sin upon himself for Jesse's good, but he's not going to leave the scene so that the healing can begin. His tragedy is that he will live through the pain — his and everyone else's. This season of this show has been one of serialized drama's greatest accomplishments. Television itself suddenly seems to have an expanded horizon of possibilities — for characterization, for juxtaposition, for thematic depth. Whatever happens from this hellish moment, the long descent to this point, with all its false dawns and sudden crashes, was singularly awe-inspiring, uniquely cathartic. Thank you all for experiencing it along with me. - Two shots in the expanded black-and-white flash-forward were real grabbers: the snail crawling along the wall in extremely shallow focus, and the teddy bear's POV as the investigators fish him from the pool and carry him to the evidence van. - "Everything's going to be okay, I promise," Walter tells Jesse when he finally gets the call he knew was coming. Walter, you do not get to promise that. - New character in this episode: Saul's cleaner. Like everybody else, he's bald. (Seriously. Everybody's bald now.) And he's a real pro. - Walter the good husband asks Skylar solicitously, "You want 2% or skim?" but Walter the conflicted dad can't bring himself to call his son Flynn. - That damnable PayPal donation site and the ding everytime a fake donation from Saul's guy-who-knows-a-guy's bot army — for Walter, it's "the beating of that hideous heart!" How could Walt Jr. possibly understand? "But dad, it's money!" You have no idea what your dad has done for money, Flynn. - Check out Walter's rictus smile for the TV cameras as his son digs dad's grave unwittingly with every well-meaning compliment: "He's always done the right thing." - Saul's cleaner advises Jesse to put on a long-sleeved shirt to hide the track marks before calling 911. Jane's dad picks out a long-sleeved dress to hide the track marks for the public viewing. And from that dress laid out on a pink bedspread we cut to baby Holly lying on a pink blanket to be changed. Devastating. - Skylar plays the wronged woman to the hilt, doesn't she — and she has every right to. But let's not forget that she's not innocent. She, too, has been trying to take control of her own life, saving the boss who clearly flatters her from what she chooses to see as his mistakes. Walter's victimhood justified his actions in his own minds, at least at first. Skylar's getting the moral upper hand temporarily from victimhood, and from the long weeks taking care of business while Walter recuperated from surgery. She's got her own hubris, and I predict it will catch up to her next season. - Moments of bone-chilling horror: Gus the upstanding businessmen being introduced to Hank as one of the sponsors of the office's fun run. Walter mumbling under the influence of narcotics, "Which one?" - Words to live by: Walter tells Jesse, wrapped in a green bathrobe and staring recovery in the face, "Lingering on things doesn't help, believe me."